Habitat: tropical and sub-tropical forests. Feeding habits: pick up foods on the ground or pick up fruits and young leaves with its hands. Food: fruits, young leaves of vegetations, insects and small birds. Size: with a body length of 55-67 cm and a tail length of 6-10 cm. Weight: 10-25 kg. Habits: It's endemic specie of China. They live in high mountains or forests in groups and they often act on the ground. 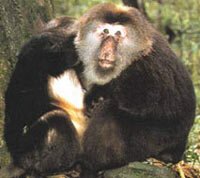 There are large groups of Tibetan macaques in Emei Mountain of Sichuan and Huangshan Mountain of Anhui. Since they are familiar with tourists, they don't fear people at all. Particularly the Tibetan macaques of Emei Mountain, because they are trained by amusing them with food, they cultivated bad habits such as to loot foods from tourists. The macaques there often hang around on the mountain paths to force tourists to give them food. If the tourists refuse to give them food, they would bite or scratch the guests; or they would loot the tourists' bags and rummage the bags all over on trees. They sometimes throw the tourists' cameras, wallets or spectacles down to deep valleys. Some tourists, being scared by the macaques, fell down from the mountain or were even pushed down to deep valleys by macaques. Some articles suggest tourists bring more food with them and throw the food to the macaques when encounter with them, so that the guests can get rid of the macaques. But, as a matter of fact, analyzing from the tenet of animal behaviors, this method is incorrect. This will intensify the macaques' concepts to ask for food from tourists. A more scientific method is not to feed them and to let them restore to their usual life behavior in natural condition. In more advanced countries or areas of the world, it is prohibited for tourists to feed animals. Distribution: Northeast of Yunnan. Mid-China, East-China and South-China.